Welcome to part two in a multi-part series meant to entertain and astonish you with the history of gaming on computers. Yes kid, there was a time when games didn't require the latest 3D accelerator cards and teams of designers. All it took was access to a computer, a little knowlege, and a little "hacker" spirit to get going and do it your self. So everyone fasten your seat belt while Sherman sets the Wayback Machine for 1959 when members of the Tech Model Railroad Club at MIT first discovered the TX-0 computer and began an odyssey that would change computers and gaming forever. The Tech Model Railroad Club had been founded in 1946 as a club for model railroad hobbyests to meet and discuss the hobby. By the time they were assigned a large room in building 20, the club began work on a huge model railroad setup. This was no ordinary setup, as the high tech inginuity that MIT students are known for was applied to it's design and continual growth. By the time 1958 came along, it had evolved in to a huge setup interconnected with a large network of controls, switches and wires. The large mess of wires and switches stretched underneath the entire display and became known as the "Rats Nest". Sloppy in it's appearance, it was continuously tweaked and those who came up with new connections or features were called "Hackers" and said to be "hacking". And thus the term "Hacker" was born. That 58-59 school year, a young freshman by the name of Peter Samson entered the TMRC and by 1959 he and some friends started exploring around the campus. Eventually, they happened upon Building 21 where, hidden in a dank basement was an "programmable" punch card reader. Because it was a punch card reader, it wasn't "guarded" like the few computers MIT had on campus. In those days, the massive room sized computers took an entire staff of technicians in labcoats that had to be on duty at any time to scramble and fix and problems. Isolated in large, heavily cooled rooms, these technicians were refered to as the "Priesthood". With the computer being the "God", these men were the only link between the computer and the user. Hardly an interactive environment condusive to designing and playing games, the computers were used for more "serious" work such as statistical and mathematical calculations and simulations. You'd write your computer program by punching holes in punchards that represented various computer instructions and data. Typically a program would entail a large stack of these cards. You'd then submit the stacks of punch cards to the "Priesthood" who would then hold on to them till it was time to run your program (in sequence with several others in a process known as Batch Processing). If your program didn't crash, you'd get the output you needed. If it did crash, you'd get a printout of the state of the computer when it crashed. Taking anywhere from a few days to a few weeks, the result was most likely your program didn't work - and you'd have to try and find what was wrong and start the whole process over again. However, what the kids stumbled on to was this small "computer" in a basement - with people rarely around. A computer they could get their hands on. Initially using it to keep track of the logic of the "Rat's Nest" and soon began messing with the wires and "circuits" of the card reader to do new things, as if they were working on the Rat's Nest itself. This "do it your self" tinkering view to computers and electronic would come to define "hacking" for generations to come. By the end of '59, MIT had aquired a "hand me down" from it's affiliated Lincoln labs. Called the TX-0, it had been built in 1956 as an experiment to build a completely transistorized computer (at a time when transistors were still new). What also made this computer unique was that it was designed for direct, real time interaction, as well as connecting new projects to it. With a built in CRT monitor (a rarity for the time), a paper tape reader (programs were instead stored as punched holes on long rolls of thin paper streams), a small speaker (which produced various noises depending on what the computer was doing) and the Flexowriter (an all-in-one keyboard, printer, paper-tape reader and puncher). The entire setup was basicly a very large personal computer. And it was just a few doors down, in Building 26, in a second floor research lab. With no bureaucracy, save a sign up sheet to reserve an hours worth of personal time on the TX-0, the young TMRC hackers began taking over the late night shifts that were never signed up for (anywhere from 11pm though 7am). Other's outside of the TMRC began joining the small conclave of devoted students, and the small group became an entity of it's own known as the TX-0 Hackers. With the young hackers writing programs to help write programs, the TX-0 was able to be wielded with even more power. Peter Samson, for example, wrote a special compiler that took advantage of the rudimentary sound capabilities to make the TX-0 play music. Soon the songs of Bach were drifting down the hallway. Another hacker hooked up the TX-0 to the phone system and used the speaker to create tones allowing him to control phone switching equipment. Soon, they began hacking the capabilities of the CRT display as well. A bouncing ball demo was among the first demonstrations on the TX-0, with the small "ball" bouncing around from one edge of the screen to the other. Other more sophisticated uses of the display were developed. Two grad students, Doug Ross and John Ward wrote a "Mouse in Maze" program. 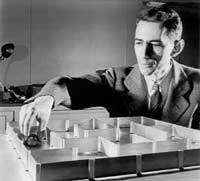 Based on the research by Claude Shannon (who did research in 1952 with a mechanical mouse that could find it's way through a maze), the program used the TX-0's light pen (a deviced that allows you to draw directly on the CRT screen and the computer in turn can be made to track and interact with what you draw) and allows the user to draw a maze on the CRT screen. A small "blip" would search through the maze, looking for other "blips" that represented cheeze wedges. Uniquely, the mouse would "remember" where the cheeze wedges were and would easily find them the second time the maze was run. In the hacker spirit, some of the other TX-0 hackers altered the program so that the wedges were replaced by martini glasses. After the mouse got a few of the martini glasses, it would start staggering about the maze, and eventually become to "drunk" to move. The Mouse in Maze program, along with a simple Tic Tac Toe game, became the 2nd known computer games, the first since Higginbothams Tennis for Two. The third was soon to follow. In the Fall semeseter of 1961, MIT recieved one of the first PDP-1's. 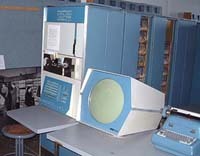 The PDP-1, was the first in a new line of computers refered to as a "mini-computer". Put out by DEC, it was designed by former MIT and Lincoln Lab technicians - some of whom had designed the very same TX-0 the hacker's cherished. It was in fact based around the TX-0 design, and included similar components - a more advanced CRT display, a light pen, a Flexowriter, a paper tape reader, a speaker, and the ability to be expanded. All with more memory (4k) and a faster speed, and an expanded instruction set. It is important to note, computers at this time had no "microprocessor". Those weren't invented for another 10 years. Rather, the "logic" or "brain" of the computer was the whole computer itself, hardwired with regular electronics and continuously altered (rewired or added on to) to create new instructions or features for the programmer to use. 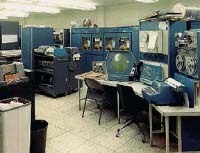 The PDP-1 was installed in the "kludge" room, which was the room next door to where the TX-0 was housed. The hackers wasted no time in converting over much of the TX-0 software to the PDP-1, and in fact they wasted no time in writing new programs. One of the most interesting and innovative was actually done as a prank. Hacking a connection between the PDP-1 and the TX-0, they created a "chat" program of sorts. They then called in Professor John McCarthy (legendary artificial intelligence pioneer and creator of the Lisp programming language) and told him they had created a new chess playing game on the PDP-1. They then called in another professor, told him the same thing and sat him in front of the TX-0. The two proceeded to send chess moves back and forth to one another, each thinking the other was a chess program. That is, until McCarthy noticed the movements were coming in one letter at a time, and sometimes lagging in between each move. Noticing the wire, he followed it to the next room and the prank was up. However, this prank was to be the first networked computer game. The hackers continued hacking away on the PDP-1, learning how to make it's display do new tricks. One important one came by accident, and it involved the other legendary artificial intelligence guru, Professor Marvin Minsky. While working on a program to draw circles with multiple straight lines, he misstyped a mathematical instruction in the computer - and came up with an actuall circle. A discovery so important, it would actually effect the field of mathematics. With that discovery, he made his "Three Position Display" program, which three particles would influence each other, making fascinating swirling patterns on the screen. It pushed the boundries of what the CRT on the PDP-1 would do, and inspired one of Professor McCarthy's grad students to start an ambitious project.